from a wide variety of connector types. 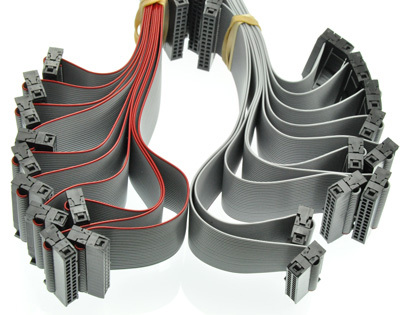 We use a wide range of tooling for Ribbon / Flat Cable assembly. Automated stripping and press crimp machines offer us the ability to price competitively with a shorter delivery lead-time. BT224 connector — also defined by BS9525-F0023, DIN41651, MIL-C-83503 standards ; these are the type used on ATA cables and are often simply called ‘IDC connectors’. They mate with either a purpose-made plug or a two-row grid of header pins with 0.1 inch (2.54 mm) spacing. D-subminiature connector — Used for serial ports and printer ports (however IDC D connectors are far less common than crimp and solder bucket types). DIN41612 connector — Used for Eurocard buses. PCB transition headers — Has two rows of pins with the same spacings as BT244 connectors. Intended to be soldered directly into a PCB. DIL headers — Has pins with the same spacings as standard DIL ICs.